The Department of Veterans Affairs has supplied Tim Fazio with nearly 4,000 oxycodone pills since he returned home after tours in Iraq and Afghanistan in 2008. Fazio says he was never in acute physical pain but used the pills to blot out feelings of guilt for surviving when many of his friends did not. Before dawn, a government van picked up paratrooper Jeffrey Waggoner for the five-hour drive to a Department of Veterans Affairs hospital in southern Oregon. His orders: detox from a brutal addiction to painkillers. He had only the clothes on his back, his watch, an MP3 player and a two-page pain contract the Army made him sign, a promise to get clean. But instead of keeping Waggoner away from his vice, medical records show the VA hospital in Roseburg kept him so doped up that he could barely stay awake. Then, inexplicably, the VA released him for the weekend with a cocktail of 19 prescription medications, including 12 tablets of highly addictive oxycodone. Three hours later, Waggoner, 32, was dead of a drug overdose, slumped in a heap in front of his room at the Sleep Inn motel. Jeffrey Waggoner’s end and easy access to the narcotics that killed him have become tragically common, The Center for Investigative Reporting has found. Since the 9/11 terrorist attacks, the agency charged with helping veterans recover from war instead masks their pain with potent drugs, feeding addictions and contributing to a fatal overdose rate among VA patients that is nearly double the national average. Prescriptions for four opiates – hydrocodone, oxycodone, methadone and morphine – have surged by 270 percent in the past 12 years, according to data CIR obtained through the Freedom of Information Act. CIR’s analysis for the first time exposes the full scope of that increase, which far outpaced the growth in VA patients and varied dramatically across the nation. Waggoner was among the victims of the VA prescription epidemic. Unemployed and newly divorced, he had joined the Army for a fresh start in 2006. After a rocket-propelled grenade blast in Afghanistan sent shockwaves through his 6-foot frame, though, he got hooked on government-issued painkillers; mentally, he never recovered. Waggoner told a nurse at the Roseburg VA hospital that he suffered from severe flashbacks that made him cry out in the middle of the night, strangling his pillow, hitting the wall. He sleepwalked, sometimes jolting awake in his closet, still battling the Taliban in the Korengal Valley of his mind. The VA responded with a battery of drugs so generous that in the weeks leading up to Waggoner’s overdose, his medical records show, he woke only to take his medicine. “When not stimulated, (he) lies on the gurney and rapidly falls asleep,” Dr. Donald J. Venes noted 10 days before Waggoner’s release. Nurse Larry Reeves wrote that Waggoner’s “eyes were just slits and he appeared to be overly sedated.” He was rushed to the emergency room after falling out of bed. In the last three hours of his life, Waggoner checked into a motel near the hospital and drank two bottles of beer. He took eight oxycodone tablets, together with a fistful of tranquilizers and muscle relaxants – all courtesy of the VA. When he fell asleep at the counter of a nearby Applebee’s while having nachos and another beer, the restaurant manager helped him back to the motel. There, Waggoner stumbled down the hallway, fumbled with his room key and collapsed face down onto the carpeted floor. Surveillance video shows other motel guests stepped over him for an hour. By the time paramedics arrived, it was too late. Waggoner died in 2008. Since then, the VA’s opiate prescription rate has continued to rise and across the country, veterans are locked in a life-and-death struggle, addicted to painkillers they got from the VA. The data shows the agency has issued more than one opiate prescription per patient, on average, for the past two years. In interviews, advocates and experts said the skyrocketing prescription rate confirmed their worst fears: that the agency is overmedicating its patients as it struggles to keep up with their need for more complex treatment. “Giving a prescription, which they know how to do and are trained to do, is almost a default,” said Dr. Stephen Xenakis, a psychiatrist and retired brigadier general who served as commanding general of the Army’s Southeast Regional Medical Command. The problem, Xenakis said, is that opiates hurt more veterans than they help. The agency long has been aware of the problem. 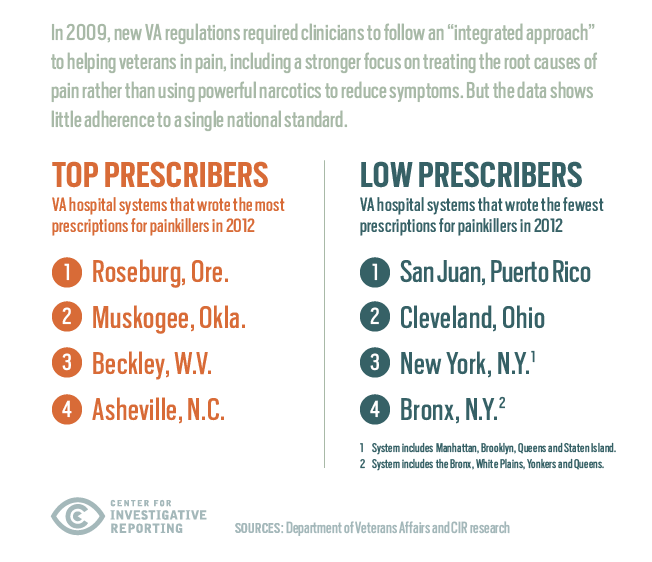 In 2009, new VA regulations required clinicians to follow an “integrated approach” to helping veterans in pain, including a stronger focus on treating the root causes of pain rather than using powerful narcotics to reduce symptoms. 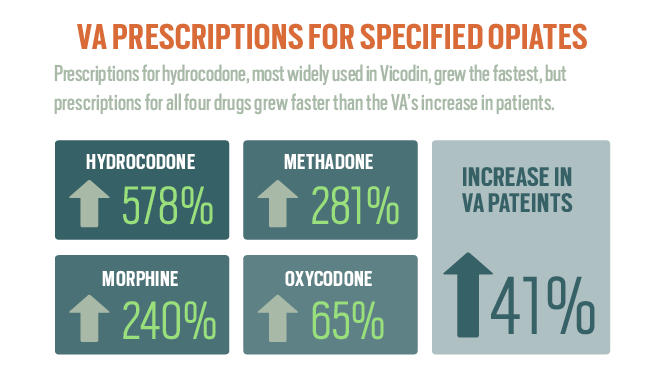 But despite the regulations, VA doctors are prescribing more opiates than ever and the data suggests that adoption of the regulations varies wildly. Last year, for example, doctors at the VA hospital in rural southern Oregon where Jeffrey Waggoner was treated prescribed eight times as many opiates per patient as their colleagues at the VA hospital in Manhattan. “The VA is very segmented, very siloed, and you have a lot of fiefdoms where hospital directors are just running their own show out there,” said Tom Tarantino, a former Army captain and chief policy officer for the advocacy group Iraq and Afghanistan Veterans of America. Late at night, Tim Fazio sits on the floor of his sparsely furnished apartment in Newport, N.H., watching YouTube videos over and over again of “One Day,” a call for peace by Jewish reggae artist Matisyahu. He prefers the night, without the loud noises that trigger his post-traumatic stress disorder. “One Day” was the favorite song of his friend and former roommate Eric Demetrion, a fellow U.S. Marine Corps veteran who died of a drug overdose June 1 at 33. Fazio met Demetrion at the VA psychiatric ward in Northampton, Mass., and the two lived together until March, feeding each other’s addiction to oxycodone and other prescription painkillers. When they couldn’t get enough opiates legally, they bought heroin – their apartment was an unkempt wasteland of pill bottles and syringes. They ate only when Fazio’s girlfriend, Jennifer Reed, drove down with a car full of steak, sausages and other favorite foods, which she cooked for them. Reed begged Fazio to leave Demetrion and move in with her, she said, and eventually he agreed. “I knew one of us was going to die,” said Fazio, who served in Iraq and Afghanistan before being honorably discharged in 2006. Now, he blames himself for Demetrion’s death, believing he abandoned a Marine in need, violating the unwritten battlefield code of ethics. Fazio’s medical records underscore how the VA deals with patients in pain – both physical and mental. He started getting opiates from the VA in 2008, two years after he left the Marines. Since then, the agency has provided him with nearly 4,000 oxycodone pills and more than a dozen bottles of tramadol, another opioid painkiller. He says he never has been in serious physical pain but instead has used the opiates to blot out feelings of guilt for surviving when so many of his close friends have not. On his bookcase, he keeps a photograph of four Marine Corps buddies: One killed himself, another was found decomposing in a Florida ditch after battling painkiller addiction and PTSD, and a third was charged with murder. Fazio’s medical diagnoses include PTSD, traumatic brain injury and anxiety, conditions for which opiates hinder recovery, studies show. Yet the VA’s scientists report that the agency’s doctors regularly prescribe opiates to these patients anyway. Last year, researchers at the San Francisco VA Medical Center published a paper in the Journal of the American Medical Association that found VA doctors prescribed significantly more opiates to patients with PTSD and depression than to other veterans – even though people suffering from those conditions are most at risk of overdose and suicide. Researchers at the agency’s Health Services Research and Development Service reported in 2011 that veterans seen by the agency’s doctors were dying from prescription drug overdoses at nearly twice the national average. And opiates are a downer, Xenakis said, so they tend to make depressed veterans more depressed. Photographs from Fazio’s childhood show a charismatic athlete, the well-muscled captain of his high school hockey team in the small town of Clinton, Mass. Today, he is a wreck, his eyes sunken in, his once-bulky arms atrophied. Sometimes, days go by when he doesn’t leave the house. With his mind no longer deadened by opiates, his PTSD symptoms have rushed to the fore. Flashbacks and anxiety make him angry and explosive. It’s been a struggle to stay clean. Not only is Fazio wrestling with emotions previously numbed by oxycodone and heroin, but he’s also fighting a VA system in which doctors keep prescribing opiates even though his electronic health record shows he is trying to kick an addiction. Hospital records indicate that the VA knew Fazio was an addict back in 2009 – and provided detox. But the agency’s doctors continued to prescribe oxycodone for three more years, until his parents hired a lawyer and threatened to sue the agency for medical malpractice. As recently as July 29, after a fight with four other men over his girlfriend landed Fazio in the emergency room, a physician at the VA in White River Junction, Vt., gave him a morphine drip – and sent him on his way with a prescription for 30 tablets of oxycodone. Fazio filled the prescription and sat in his apartment, staring at the bottle. “I opened it up a couple of times a day for three or four days to take one out,” but never swallowed one, he said. So he flushed them down the toilet. 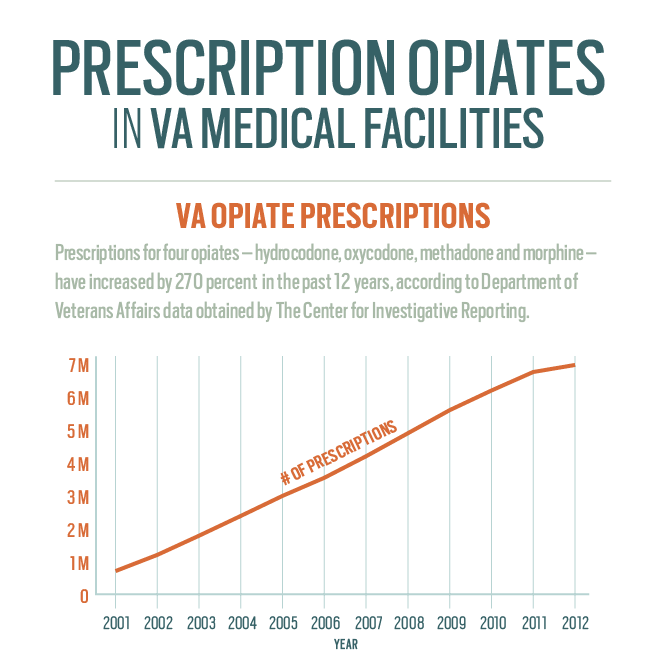 Since the 9/11 attacks, no VA hospital system has prescribed more opiates per patient than the Jack C. Montgomery VA Medical Center in Muskogee, Okla. Over the past decade, the hospital and its clinic in Tulsa issued 1.6 opiate prescriptions per patient. The results can be seen in Tulsa’s jail and in its criminal courthouse, which has called a special docket for veteran offenders every Monday since December 2008. Observers say geography is a contributing factor. The VA hospital in Muskogee is an hour’s drive from the region’s main population center in Tulsa. And the VA’s single-story clinic in Tulsa has no emergency room or urgent care ward and rarely makes same-day appointments. Veterans who need treatment for the root causes of pain often wait months, said Craig Prosser, who coordinates the court’s mentor program. “If I have to wait 30 days, 45, all the way up to 90 days to be able to get seen by my doctor, I’m probably going to go out and try to find something to deal with the pain prior to,” Prosser said. The region’s opiate prescription rate has dropped slightly in the past year, and Prosser credits a new director of the Muskogee VA for expanding services. The VA would not allow the hospital director, James R. Floyd, to be interviewed. It’s 100 degrees and humid outside as dozens of veterans file into the first-floor courtroom of Judge Rebecca Nightingale, who presides over Tulsa’s Veterans Treatment Court. Prosser greets each of them individually and goes over their treatment, slapping them on the back and occasionally giving one a hug. On this August afternoon, they range from elderly Vietnam veterans who’ve pleaded guilty to possession of methamphetamines to an Iraq War veteran who beat his girlfriend so brutally that her eyes swelled shut. John Cloud, a Vietnam veteran who is the American Legion’s liaison to the court, describes a troubling pattern among Iraq and Afghanistan veterans arrested in Tulsa. It starts in the military, after injuries from an explosion or enemy fire leads to a prescription for Vicodin or oxycodone, he said, and then continues at the VA. Eventually, Cloud said, the veteran builds up a tolerance. The VA’s prescriptions are not enough, so “they’ll go to the streets and buy the drugs, turn to alcohol” and cheat and steal to get money to feed their habit. A bearded man in a denim jacket drags his right leg as he approaches the judge. Chance Oswalt has been struggling with painkiller addiction since 2007, when the Army prescribed Percocet after he was wounded in Baghdad. Last Christmas Eve, police found Oswalt passed out in Room 906 at the Marriott Tulsa Hotel Southern Hills, surrounded by syringes, spoons and other drug paraphernalia, with a black rock of heroin on the nightstand. Since the arrest, Oswalt hasn’t tested positive for heroin while participating in the VA’s court-mandated pain management program. But he has continued to doctor-shop, driving 100 miles to a private physician near the Arkansas border for oxycodone. During the hearing, the judge remains relentlessly upbeat, telling veterans they have the power to stay clean. Nightingale reassures them that they are not to blame for their addictions. She tells Oswalt: “You wouldn’t have chosen to take all those medications,” and he agrees. Officials in Tulsa take pride in their program – more than 90 percent of veterans who enter the treatment court graduate. Very few have re-offended. But Nightingale knows the stark facts: For every veteran who graduates, another enters the criminal justice system. Senior data reporter Agustin Armendariz contributed to this story. It was edited by Amy Pyle and copy edited by Nikki Frick and Christine Lee. This story was produced by the independent, nonprofit Center for Investigative Reporting, the country’s largest investigative reporting team. For more, visit cironline.org. The reporter can be reached at aglantz@cironline.org.